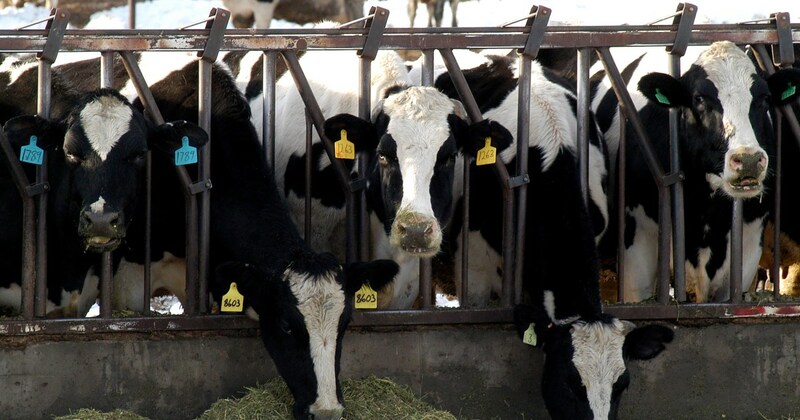 ,800 dairy cattle a little over in a dozen farms, ways to dispose of cattle that are the main source of their livelihood. A parched region of the state, the Yakima Valley is hosted with many dairy farms that use open lots for their cattle, meaning their buildings have no walls. It's usually not a problem because the area only gets six to eight inches of rain per year. But on Saturday farmers say that a storm announces to bring three to five inches of snow, which is a huge snowfall by their standards, suddenly dropped 18 to 24 inches with winds of 40 to 50 mph and gusts of up to 80 mph. Jason Sheehan, 44, ran a dairy farm of 5,000 cattle for 17 years in the valley. On Saturday, more than 200 of his cattle died in the storm. He did not see anything like this, he added, adding that is the latest challenge for dairy struggling producers. "It's four years of thin margins and losses," Sheehan says, conducting 35 people in his dairy farm. "We are struggling financially for four years, and now Mother Nature is throwing another twist. It's a tough time to do it." Most of the farms in the area are medium to large dairies milk 3,000 to 5,000 cattle each, according to Stuart Turner, an agronomist consultant for farms in the region. Turner said that farmers were not prepared for a typhoon of this magnitude, but did what they could to protect their herds. Some went up to build walls from hay bales to give the cattle some shelter. But to keep warm at dropping temperatures, cattle are collected and some are slapped or crushed in the process. Farmers can not get animals, each of which weigh around 1,200 pounds on average, to move. "It's just brutal" for dairy farmers, which is "the toughest corner in agriculture," said Stuart. "Compared to 2013, the average farm income on average is down 40 percent. Name an industry that has to maintain the same base base and get a 40 percent hit and continue." Perhaps they are worth an average of $ 2,000 each, meaning that the farms together have lost millions of dollars as well as their animals. Sheehan said that during the hurricane his farm had to stop milking for the first time since it opened in 1978. It was also the first time he remembered the milk trucks that did not make rounds to take the milk, because the area is often exceeded by extreme weather. "There was a whole group of milk workers working on that storm, trying to do all these for all these animals," Sheehan said. . "We have a really good team of people around here, and all employees have put their hearts and soul into it and there are many tears around it." But farmers do not have time to mourn their losses, as many must return to work as well as to know what to do with the dead cattle. "What people hear today is the damage caused by the typhoon, but they do not understand these are the fields that need to be run continuously," says Kimmi Devaney, director of community relations for Dairy Farmers of Washington, pointing out that cattle are eaten two to three times a day. "It really shows the spirit of dairy The community that the peasants who are not heavy hit come out to help those in difficult times, "he said. While no specific plan was made on Wednesday, Steven George, the coordinator's management issue for the Washington State Dairy Federation, said farmers are trying to get the bodies out of a mass grave, which may have a negative impact on groundwater. "There's an on-farm compositing of mortalities," George says. "It's an acceptable practice, but it's likely that it's going to be overwhelmed, they're used to making a couple a day. We look at other potential options." George said that possibilities include the composting of cats at Sunnyside, Washington, or landfill at the Oregon state border. Meanwhile, Shaheen said that he and his employees kept focus on the cows that they still have. "We need to take care of what's alive and make sure they are comfortable and watered and milked and everything," he said. "We tried to focus on what was left instead of getting down about what was not done by the storm." Phil McCausland is an NBC News reporter focused on rural-urban divide.